The future of digital entertainment rights could turn into a battleground for control in the coming months. In one corner is Apple, the largest music retailer in the United States. And in the other is DECE, a US consortium of entertainment, retail and IT companies that want to set new standards to transform how consumers buy, access and play digital content. 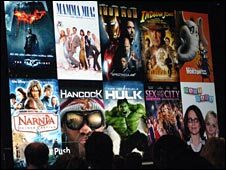 "This is setting up to be a war between DECE and Apple," said MG Siegler of online news site VentureBeat.com. "It seems DECE is working on a kind of new generation of DRM (Digital Rights Management or copy protection) so that they will still be able to be in control of the content of their members," he said. He predicted this will result in a stand off with Apple, which is not a member of DECE. "Without Apple's participation in DECE, you can be sure that its devices will not play content made by the consortium. It will surely work the other way around also with none of the DECE content being able to be played on Apple devices," suggested Mr Siegler to BBC News. 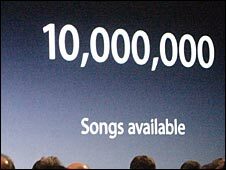 Just last week at Macworld in San Francisco, Apple announced it would drop DRM restrictions on the 10 million songs in its iTunes store. That now means users can play what they have paid for on any device. The lifting of the copy restrictions does not apply to movies and TV shows. 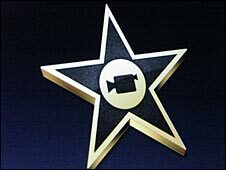 More than 25 major companies have signed up to be part of the Digital Entertainment Content Ecosystem which plans to set standards and specifications for upcoming devices such as phones, DVD players, streaming services and computers. DECE includes Sony, Paramount Pictures, Lionsgate, Microsoft, Best Buy, HP, Cisco, and Intel among others. 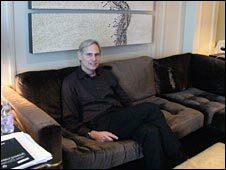 DECE President Mitch Singer, who is the chief technology officer for Sony Pictures, told the BBC. "All of the companies in this consortium realise if we can do this and do this right we have the potential for a very large market." He estimated the starting value as a "five or six billion dollar business" and noted "we are in the very very early stage of this global digital marketplace." However Mr Singer took issue with suggestions that DECE's decision to set up its own ecosystem for digital entertainment such as movies, books, TV programmes and games will result in a major clash. "Yes Apple has the lion's share of the digital sell through and a lot of consumers are using it but DECE will give consumers choice and a greater digital experience. "I don't see Apple and DECE being rivals in this eco system. We will live alongside one another in the same way Blu-ray lives alongside DVD's and Netflix alongside Apple." Last week at CES, the world's biggest electronics show, DECE was expected to make a "coming out" announcement about standards. Instead it announced six new partners including Panasonic and Samsung. In total the group now has the support of five of the largest TV manufacturers, six Hollywood studios, five powerhouse tech companies and an array of players in other segments of the industry. Jon Healey of the Los Angeles Times asked "If the DECE system doesn't work with iPods, iTunes and iPhones, won't that make it a non-starter for millions of consumers?" Mike McGuire who is the vice president of Gartner's media industry advisory service agreed that both parties are on a possible collision course. "A face off is going on now because we are talking rhetoric and not deployment. When it will really matter is when this stuff hits the marketplace and that is a long way off," he stated. There is also the possibility that Apple will join DECE. "If what DECE does adds up to a huge ecosystem then it might be hard for Apple to keep out of it," said Mr Siegler. "But it is Apple we are talking about and they have always done their own thing." Mr McGuire also thinks there is not much chance of Apple joining the consortium. "One has to ask the classic Apple question which is "how do we benefit?" In other words we are doing pretty well just now why sign onto another standard? "Apple is going to be a tough one to pull into the can," he said. Mr Singer said DECE would love to have the company join but that it was not going to campaign for them to get involved. Meanwhile Mr Singer said DECE members were working hard and meeting regularly to progress plans for an architecture that he envisaged will result in an "everywhere entertainment vision" based on open standards. "We are saying let's create an ecosystem where we can let the mass of people enjoy content by downloading it on devices without having to count copies for example. "You should be able to stream content to a centralised "virtual locker" so you can buy from multiple store fronts and access that content anywhere you happen to be," said Mr Singer. Some predict some tough challenges ahead, not least from the competing interests of the companies involved. "Participants range from the major movie studios that create digital content, to the technology companies that make software and devices on which that content can be viewed, to digital rights management companies that protect that content, to telecom equipment companies that make the gear over which that content is delivered," he said. Any new generation of digital rights management is likely to be unpopular with consumers, thinks civil liberties organisation the Open Rights Group. Jim Killock, Executive Director of the Open Rights Group, said: "Consumers don't like DRM. They want to be able to play their movies on their computer, ipod, or whatever device they've bought, and DRM gets in the way. If movie sellers make it difficult for consumers to play their movies, then they will sell less films."